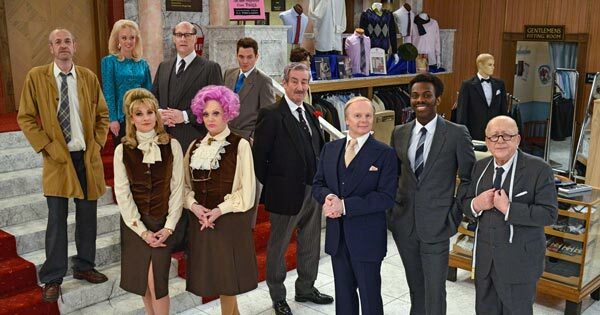 More than 30 years since it was last on our screens, classic British sitcom Are You Being Served? is coming back to BBC One in September with a new all-star cast. Now, the new remake of the show has released its first look imagery of the new cast, which includes BAFTA winner Jason Watkins (The Lost Honour Of Christopher Jefferies) as Mr Humphries; Sherrie Hewson (Benidorm, Coronation Street) as Mrs Slocombe; John Challis (Only Fools And Horses) as Captain Peacock; Roy Barraclough (Coronation Street) as Mr Grainger; Arthur Smith (Grumpy Old Men) as Mr Harmon; Mathew Horne (Gavin and Stacey) as Mr Grace; Justin Edwards (The Thick Of It) as Mr Rumbold, Jeorgie Porter (Hollyoaks) as Miss Croft; and Niky Wardley (The Catherine Tate Show) as Miss Brahms. The one-off revival of Are You Being Served?, which originally ran from 1972 to 1985, will be screened in September as part of the BBC’s Landmark Sitcom Season. Other classics being revived for the occasion include Porridge, Up Pompeii! and Keeping Up Appearances.